First of all, why is this exhibition titled "Flash"? I had no clue, and had been wondering about the title. A chat with Gallery Project's co-founder, Gloria Pritschet, when I stopped by today to see the exhibition, unlocked the mystery. 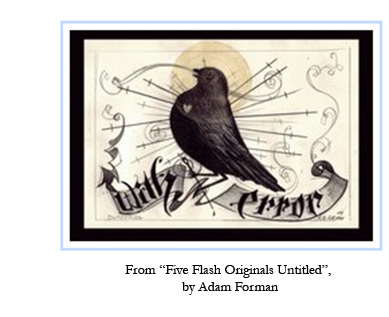 It so turns out that a "tattoo flash" is a design for a tattoo that a tattoo artist prints or draws on paper or some other medium, prior to the actual tattooing. As Wikipedia explains: "	A tattoo flash is a tattoo design printed or drawn on paper or cardboard, and may be regarded as a species of industrial design. It is typically displayed on the walls of tattoo parlors and in binders to give walk-in customers ideas for tattoos." It so happens that this morning's edition of the Michigan Daily (UM's campus newspaper) contained, by coincidence, an article that referred to tattoos. In this article ("The Art of Americana" by UM undergraduate student Whitney Pow), the author sings a paean to tattoos (and 24-hour diners) as the epitome of authentic Americana: "If you’ve ever been to the Fleetwood [Diner], I think it’s undisputable there’s an art to putting together the perfect reuben, buttering the perfect late-night toast and being just the right kind of diner waitress: apron filled with single-serving creamer packets, taking orders with perfect poise and a consistently hard-hitting grumpy demeanor, tattoos snaking around the small of her back [...]"
Maybe we’ve gotten this all wrong. It’s not the haute couture that should be catching our attention, not the desirability of catwalk bodices glittering in a way that only millionaires could afford. What we should be looking for are the ketchup-stained aprons of diner waitresses, the arm tattoos of the Fleetwood chef frying up hash browns for hungry, hung-over customers at ten o’clock on a Sunday morning. Anyway, to come back to the exhibition: For reasons of space, I will limit myself to talking about only a couple of the works on display (which are many: there are a total of thirty-six numbered pieces on display, many of them consisting of groups of multiple items). You should definitely go and check out the exhibition yourself, if you can. As you can see from the image, this flash depicts a bird (a dove?) with a whitish heart painted on its left breast, at the center of a converging set of straight lines, and with the words "with error" written in a gothic script at the bottom. Curiously, the other four flashes that make up this sequence all seemed to me to refer to religion, especially, Christianity, in some elliptical or tangential way. This could make the viewer interpret this particular, somewhat cryptic, flash through the lens of a religious interpretation also. The straight lines that converge on the figure of the dove seem to me to be like very elongated crosses, leading me to think that the subtext of this flash is the Crucifixion. The identification of Christ with the dove is also standard in Christian iconography... as the Protoevangelium attributed to St. James says, " And lo, an angel of the Lord appeared saying unto him: "Go forth and assemble them that are widowers of the people, and let them bring every man a rod, and to whomsoever the Lord shall show a sign, his wife shall she [Mary] be." [...] Joseph received the last rod: and lo, a dove came forth of the rod and flew upon the bead of Joseph." The halo around the head of the dove in the flash seems to lend further credence to this interpretation -- clearly, divinity is being attributed to this dove-figure. But what of the caption saying "with error"? I am not sure of this, but I think that this, too, could lend itself to an interpretation consistent with my hypothesis. Christ, after all, is, in Christian mythology, the son of god who appears in human form, and his humanity then points to the fallible, error-prone nature of man, as God endows man with free will precisely so that man can commit errors. Furthermore, the word "error" has a phonetic similarity with "arrow", and perhaps we can think of the converging straight lines as a set of arrows piercing the dove, in yet another metaphor (alongside the Crucifixion) of martyrdom -- especially the martyrdom of St. Sebastian. I looked at the "artist's statements" stored in a corner of the exhibition to see if I could find any clue to the work, but Forman's statement about himself was also very gnomic and cryptic. He says: " I respect yet resent the hammer that forged me as an artist. However, I constantly strive to relate to the smith and not the shoe." He seeks, it thus seems, a relationship with what he appears to conceive as a Creator, and so my guess is that the religious interpretation of his work that I ventured above may not be very much amiss. 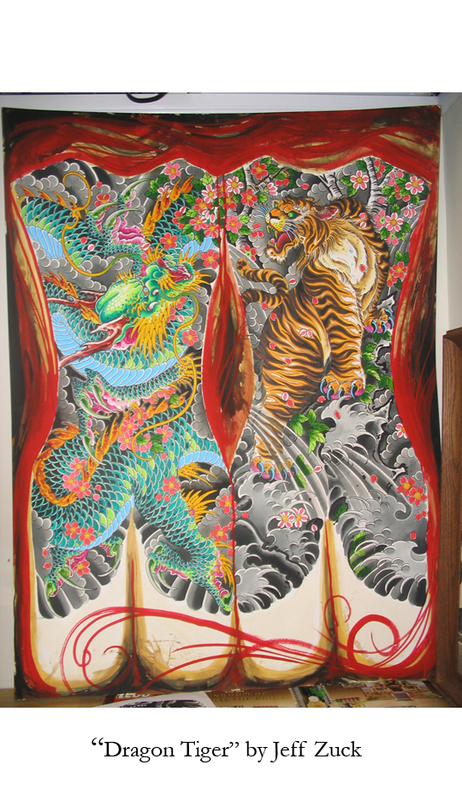 Another very interesting work at the exhibition is Jeff Zuck's "Dragon Tiger" (liquid acrylic on illustration board). You can see it at the bottom of this blog posting. Although I had initially thought of it as a stylized representation of a four-fingered palm of a hand, if you pay attention, you can see that it actually represents two human bodies (torsos), side by side, viewed from the back -- a dragon on the back of one and a tiger on the back of the other. In the hand of the giften tattoo artist, the human body becomes... a dragon, a tiger, at the will of the tattoo machine vibrating with skilled dexterity, inscribing its magic on the canvas of the human skin, its potentiality limited only by the imagination.